LIFE's not fair, and it only took Nick Packard nine years to figure out why. The boy, who is now a 26-year-old comedian and writer, analyzed Milton Bradley's popular board game -- and was enraged by the injustice he discovered. 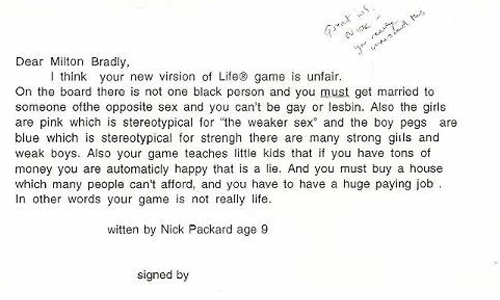 Thanks to a scanner and Facebook, Packard went ahead and shared a copy of the letter he wrote to the toymaker when he was a kid (on a typewriter! ), calling out the lack of diversity, gender parity and more troubling characteristics in "The Game of Life." Mara Wilson (you might know her as the ultimate precocious child "Matilda") tweeted out the image calling Packard "a more sensitive, socially aware kid than you were." At HuffPost Parents, where our group blog is comprised of so many different types of families all doing their best to raise decent kids, we wholeheartedly agree. Packard's refreshing acknowledgement of reality reminds us that when it comes to wisdom, age is just a number. On a lighter note, below are 11 (Satirical) Questionable Lessons From Board Games.